Jurisdiction: The Supreme Court has the power to review and revise sentences imposed by lower courts. On petition, cases involving substantial questions of law, great public importance, or emergency. Selection and Tenure: The justices of the Supreme Court are appointed by the Governor after nomination by a judicial nominating commission. After an initial two-year term, they run on a "Yes/No" retention ballot, and, if successful, they then serve ten-year terms. Courts: The Court of Appeals divides Indiana into five districts. Judges: 15 judges (3 per district). All of the judges select a chief judge, and the judges of each district select a presiding judge. Jurisdiction: The Court of Appeals has no original jurisdiction except as authorized by Supreme Court rules to review directly final decisions of certain administrative agencies. It has jurisdiction over all appeals not taken to the Supreme Court. Selection and Tenure: The judges of the Court of Appeals are appointed by the Governor after nomination by a judicial nominating commission. After an initial two-year term, they run on a "Yes/No" retention ballot in the district that they serve, and, if successful, they then serve ten-year terms. All judges must retire at 75. 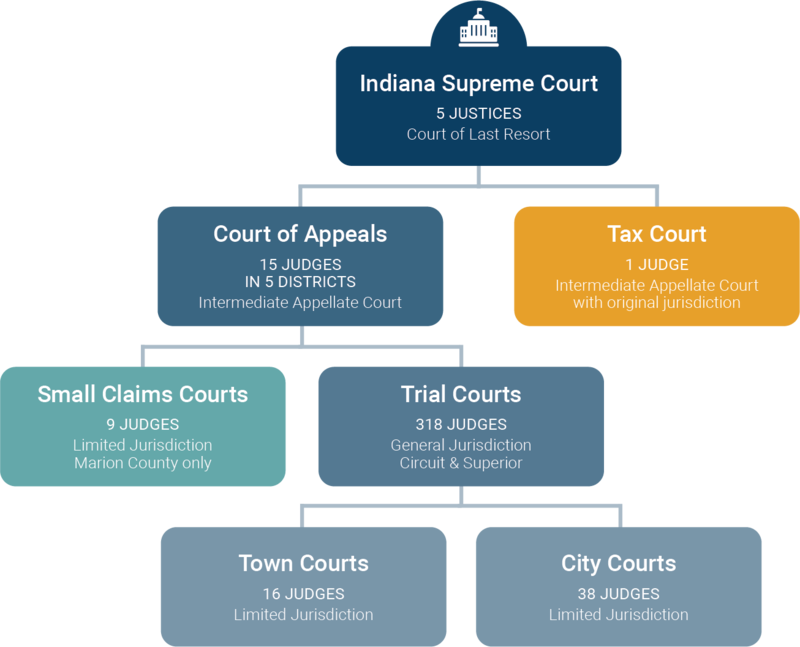 Courts: One court in Indianapolis although a taxpayer may elect to have all evidentiary hearings conducted in one of seven other specifically designated counties. Jurisdiction: The Tax Court has exclusive jurisdiction in original tax appeals, which are defined as cases that arise under the tax laws of this state and which are initial appeals of a final determination made by the Department of State Revenue of the State Board of Tax Commissioners. Appeals from the Tax Court are taken directly to the Supreme Court. Selection and Tenure: The Tax Court Judge is appointed by the Governor after nomination by a judicial nominating commission. After an initial two-year term, he runs on a "Yes/No" retention ballot, and, if successful, he then serves ten-year terms. All judges must retire at 75. Courts: The organization of Superior Courts vary from county to county. Judges: 201 judges as of January 1, 2016. Jurisdiction: The Superior Courts have original and concurrent jurisdiction in all civil cases and in all criminal cases. They also have appellate jurisdiction over city and town courts. Selection and Tenure: With the exception of four counties, the Superior court judges are elected at a general election for six-year terms. In Lake and St. Joseph Counties, the Superior court judges are nominated by local nominating commissions and then appointed by the Governor for six-year terms. Thereafter, they run on a "Yes/No" retention ballot. The judges of the Vanderburgh Superior Court are elected in non-partisan elections. In Allen County, the Superior court judges are elected at the general election on a separate ballot without party designation. Vacancies, however, are filled by the governor from a list of three candidates nominated by the Allen County Judicial Nominating Commission. Courts: Indiana's 92 counties make up 91 judicial circuits, while Ohio and Dearborn counties are in a "joint" circuit. They share one judge for their combined circuit court. Beginning in 1990 with Monroe County, several counties successfully petitioned the General Assembly to remove the distinctions between circuit and superior courts found in the constitution. Delaware County courts followed in July of 2000. Continuing this trend, superior courts in Henry, Madison and Clark became circuit courts. For example, Henry Circuit Court, Henry Superior Court 1 and Henry Superior Court 2 are now known as Henry Circuit Court, Divisions 1, 2, and 3. Judges: 115 judges as of January 1, 2016. Jurisdiction: The Circuit Courts have concurrent jurisdiction in all civil cases and in all criminal cases. They also have appellate jurisdiction over appeals from city and town courts. Selection and Tenure: The voters of each respective circuit elect the judges of the circuit courts in partisan elections every six years. The only exception is Vanderburgh County where the election is non-partisan. Jurisdiction: The Probate Court has original and concurrent jurisdiction in all civil cases and in all criminal cases. It also has appellate jurisdiction over appeals from city and town courts. Selection and Tenure: The judge is selected by the voters of the county at a general election for a six-year term. Courts: Only Marion County has a distinct Small Claims Court. Judges: The Marion County Small Claims Court has nine divisions. Each division has jurisdiction in the township in which it is located. Jurisdiction: The court has original and concurrent jurisdiction with the circuit and superior courts in all civil cases founded on contract or tort in which the debt or damage claimed does not exceed eight thousand dollars ($8,000), not including interest or attorney fees; original and concurrent jurisdiction with the circuit and superior courts in possessory actions between landlord and tenant in which the past due rent at time of filing does not exceed eight thousand dollars( $8,000); and original and concurrent jurisdiction with the circuit and superior courts in actions for possession of property where value of property sought to be recovered does not exceed eight thousand dollars ($8,000). Selection and Tenure: The Small Claims court judges are elected by the voters within the township in which the division of the court is located. The judges serve four-year terms. Courts: As of January 2016, there were 43 City courts. Jurisdiction: Jurisdiction of city courts varies depending upon the size of the city. All City courts have jurisdiction of city ordinance violations, misdemeanors and infractions. Selection and Tenure: City court judges are elected for four-year terms by the voters of the city. Courts: As of January 2016, there were 22 Town courts. Jurisdiction: Town courts have exclusive jurisdiction of all violations of town ordinances and jurisdiction of all misdemeanors and infractions. Selection and Tenure: Town court judges are elected for four-year terms by the voters of the town.